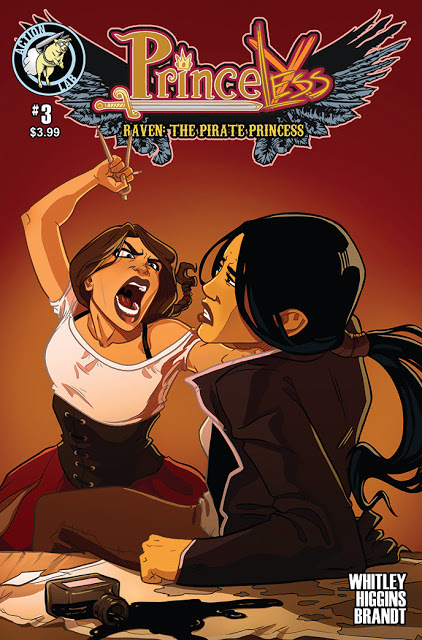 This month's 'Princeless - Raven: The Pirate Princess' is light on the adventure and deep in interpersonal issues that will drive the narrative going forward. Katie and Sunshine recruit at Katie's D&D club while Raven tries to reconcile with an old friend. It's an emotionally charged issue displaying Jeremy Whitley's keen sense of dialogue and character building while Rosy Higgins and Ted Brandt once again provide a beautifully rendered world. A situation like this, where the lead character tries to convince an old friend turned antagonist, would usually be solved in a manner of pages in order to conveniently move the plot along. Except Whitley respects his characters and his audience too much to simply wash over the devasting events of the past for the sake of getting to the lighter parts of the story. Especially because what happened between Raven and Ximena puts Raven in a bad light. The broken trust affected Ximena profoundly and she lets Raven know it. It's not easily swept away because there were serious consequences to her actions. Whitley reveals a depth among characters that isn't common in comics, forget about all-ages comics. It's important for younger readers to see this kind of discussion where feelings are exposed and shared. It's a beautiful exercise in problem resolution told in a mature manner. It's not all so serious as Sunshine visits with Katie's club and there's a great atmosphere of diversity and acceptance. Women of different colors and sizes all with common interests. Sunshine takes part in a tabletop game and learns quickly. It's an endearing sequence as she quickly assimilates to her new surroundings. Meanwhile, Katie seeks the permission of a committee to gather recruits to join Raven in her quest for revenge against her brothers. Take a good look at that committee as they may look a little familiar. A nice easter egg for comic book fans. Higgins' character designs are some of the best in the medium as they are so diverse and costumed in various ways. There's an attention to detail and meticulous execution in delivering a fully realized world with not only intricate backgrounds but expressive and unique individuals. Brandt brings warm lush colors to interiors that make Ximena's business cozy despite the frigid reception she gives Raven. The exteriors are dark and gray and blue that capture the rainy evening perfectly. Higgins and Brandt add immense emotion and warmth with exceptional artwork. 'Princeless - Raven: The Pirate Princess' is a delightful series full of wonderfully diverse characters set on an incredible journey. Yet, the creators don't take anything for granted. They trust in their characters and their audience to invest in not just the action and jokes but all the emotional ties that bind them. It continues to be an excellent comic regardless of genre.